2-3 Spring onions chopped along with the green’s. 1/4 cup of carrots grated. Note: The herbs should be added very less or else it will overpower the taste. Makes around 3 big sandwiches. In a non stick pan, lightly toast the bread slices using butter on one side. Lightly crush all the dried herbs within your palm and mix it along with the vegetables, curd or cream cheese and salt. If using cheese, add less salt. Use the vegetable mixture immediately or else the vegetables will release water and the sandwiches will become soggy. Spread the vegetable mixture on the toasted side of 3 slices of bread. Cover or close with the other 3 slices, toasted side facing inside on the sandwich. Now again lightly toast the sandwich using butter on both the sides in a non-stick pan or in a sandwich maker. 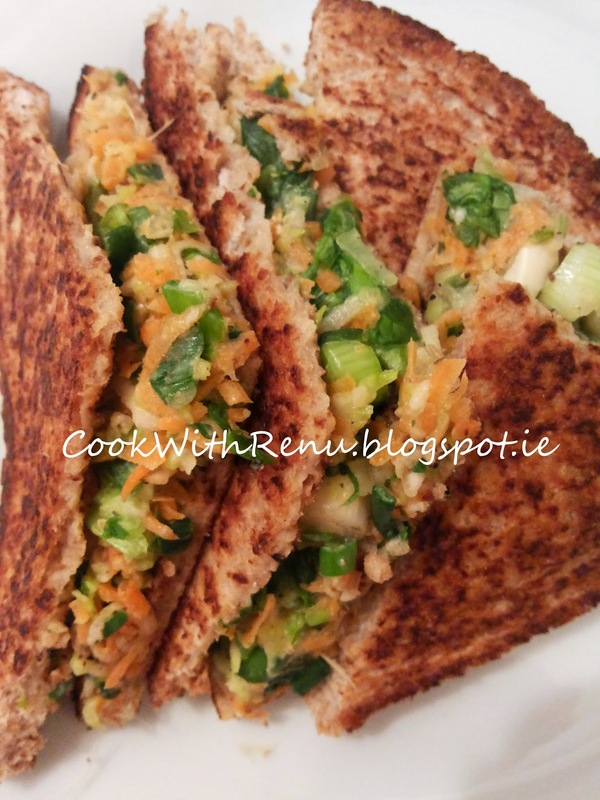 Yummy and healthy Vegetable toasted sandwich are ready. Serve it hot with Tomato Ketchup.